The three flags fly above Veterans’ Memorial Park for the last time this year. OSWEGO, NY – More than six dozen people, young and old, gathered in Veterans’ Memorial Park on Friday. 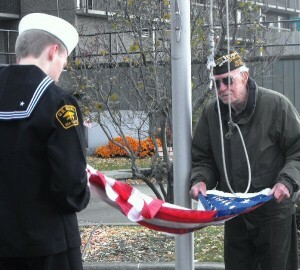 Seaman Apprentice Matthew T. Glenn assists Oswego veteran Paul Riordan in folding the American flag. 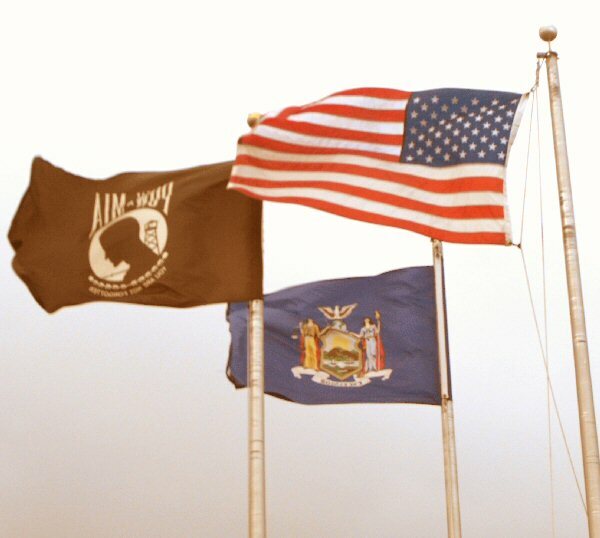 The flags at the center of the park were lowered; the Oswego City flag was first. It was solemnly folded. 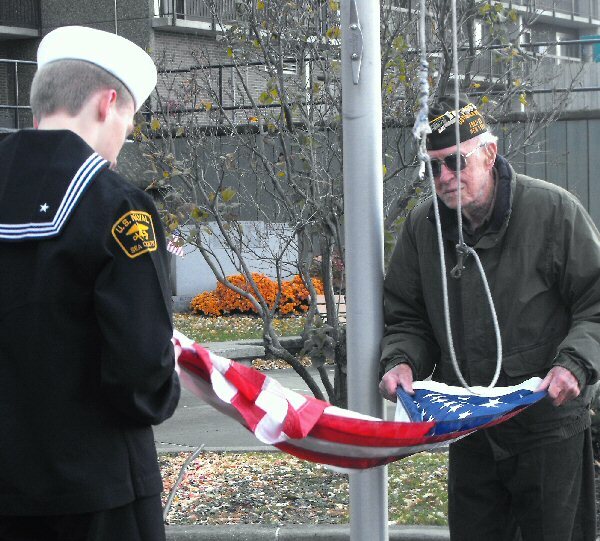 Seaman Apprentice Matthew T. Glenn, of the Oswego Navy Sea Cadet, assisted Oswego veteran Paul Riordan in lowering and folding the American flag. 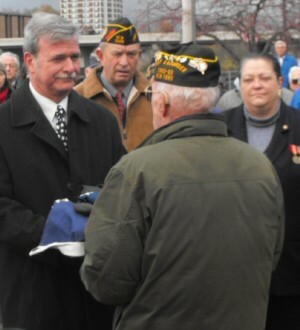 He then presented the flags to Oswego Mayor Randy Bateman. The mayor accepted the colors on behalf of the city. They will be stored over the winter and then returned to their place of prominence next spring when Mayor-elect Tom Gillen presides over his first Memorial Day ceremony. 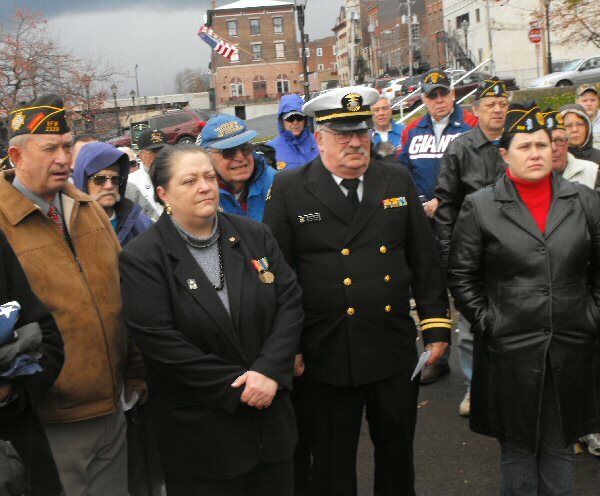 A large crowd turned out Friday morning to honor this nation’s veterans. The temperature toyed with 50 degrees last year, making it one of the nicer days on which the ceremony has been held. 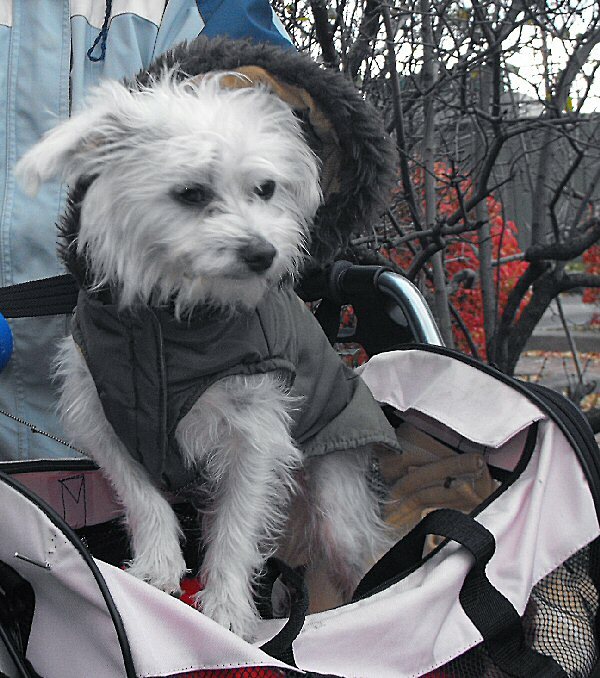 On Friday, snow was in the air and the temperature languished in the upper 30s. However, this year’s crowd appeared larger than in 2010, as more than 70 people huddled in the park. There are many ways to honor a veteran on this day, Hoffman told the crowd. 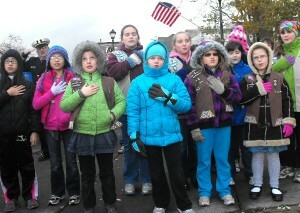 Representatives of the Girl Scouts lead the crowd in reciting the Pledge of Allegiance. The ceremony was attended by dozens of members of local organizations including the VFW, American Legion, Elks and Girl Scout (who lead the crowd in the Pledge of Allegiance). Friday marked the 93rd anniversary of that first observance, Hoffman, the day’s MC, added. 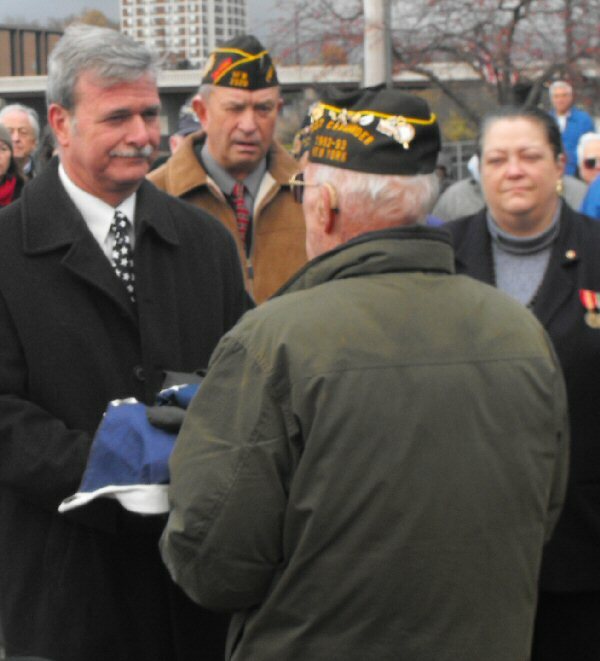 Oswego veteran Paul Riordan presents the flags to Mayor Randy Bateman. Seaman Apprentice Glenn said he hopes to attend the US Naval Academy some day. Ruffles sits in his baby stroller and watches the ceremony. He was dressed in his own miniature parka to stay warm. However, the wind was so strong it kept blowing his hood off.